Have a look at our new Mother’s Day recipe showstopper. This edible bouquet is not only delicious but easy on the eyes too! Preheat oven to 180°C (160°C for fan ovens), Gas Mark 4.Place the cupcake ingredients in a bowl and beat with an electric hand mixer for 2-3 minutes until pale and creamy. Spoon mixture into the muffin cases. Bake for 15-18 minutes until springy and golden. Transfer to a cooling rack to cool. Using an electric whisk, beat the icing sugar, buttery baking spread and, vanilla extract with enough condensed milk to make a thick icing. Put half of the icing in a separate bowl and colour with a little pink colouring, colour the remaining icing with more pink icing so you have two shades of pink. Using a petal nozzle on a piping bag, fill the two shades of icing on either side of the bag. Pipe in an irregular spiral from the middle of the cake outwards. 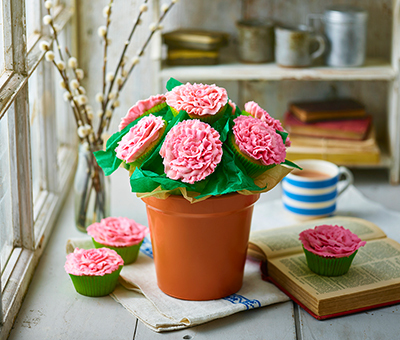 Once the cupcakes are iced you can leave them in the fridge for the icing to firm up whilst you assemble the flowerpot. Cover the polystyrene sphere in green tissue paper and place it on top of a larger piece of square of baking paper and sit it on top of the flowerpot. Push cocktail sticks halfway into the polystyrene and then place your cupackes onto the sticks. Fold pieces of tissue paper and fill in the gaps between the cupcakes. Get creative with your bouquet decorations, use gift ribbons or different colouring in the icing, try more.